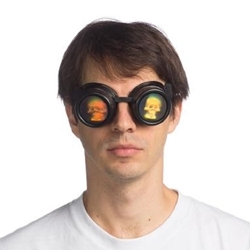 The Holographic Skull Steampunk Goggles are a pair of goggles with adjustable back strap, featuring holographic skull lenses. Clear lenses are also included. Steampunk is a broad genre, often encompassing settings ranging from Victorian to post-apocalyptic, fantasy to horror, and more. Steampunk fashion is often inspired by 19th century styles and technology. Goggles are a very popular choice for many different types of Steampunk Costumes. Complete the look how you see fit – a Steampunk Hat and a Victorian style costume are a great place to start!